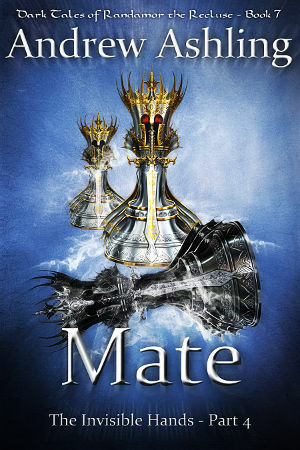 My latest Epic Fantasy Gay Romance book, Mate, part four of The Invisible Hands, the seventh volume in the Dark Tales of Randamor the Recluse series is now live on all vendors. and, of course, this site in the eShop (epub & mobi). If you want to receive an email when I publish a new book, please subscribe to my New Releases Newsletter. Congratulations, Andrew! I’m excited to read it. Thank you, Andrew, for your last work. “Mate” is now in my library and is the first in the list of the “To be read” books. Please don’t forget to download the corrected version. You’ll find the procedure in this post. Hopefully Navastas’ story will continue. I’m planning — sometime in the future — a book about the reconquest of Trachia. Navastas would be a part of that story. Well done Andrew! Don’t you now have to re-draw that map? While I feel satisfied with Mate, I still feel there is much more to know, after all Anaxantis is only 18/19? I imagine him at 34, 44 and how much he would have accomplished by then. Perhaps by then the Devil’s Crown is his already. The Plains has been revived to a city to behold and so on and so on. I wonder though if he and Ehander can ever move past what they did to each other. As much as they say they have. I feel there is something beneath that will continue rising up every now and then and it would take more than Ehander ‘rescuing’ Anaxantis or vice versa for each to feel liberated enough to find the kind of peace-of-soul they each need. To know I was rooting for Yorn to be the Prince of Trachia. Oh well, Lexyntas will do too, can’t have it all. There is still the story of the two sweet little Billy Goats to tell too; they just can’t be left behind. All of that said, now to the editing bit. Though it took not a thing away from the story, I found there were quite a bit of typos, grammar malfunction and even a whole paragraph from one chapter repeating itself in another chapter. Was there some translation going on that went a bit awry? Yet, in fairness to the author I have to admit and appreciate what must be countless sleep-deprived hours it took to produce these books. As I said for all those things, it did not reduce my enjoyment of the Mate one bit. . . . and once Andrew has rested up a bit, I dare say something of the same enjoyable caliber will be coming our way. Meantime I’ll start over from Bonds of Hate and read once again to my heart’s content. thanks Andrew for bringing us into Anaxantis’ world where the wicked do not prosper and the poor and the honest are being championed selflessly and without guile. I meant Antybion, not Yorn. First of all, MissyE, thank you so much for casually going over the shoddy editing of the first version of Mate. You’ll find more about this issue, and how to get the corrected version in this post. That said, obviously this story isn’t finished. Anaxantis is nineteen-going-on-twenty and Ehandar twenty-going-on-twenty-one. Emotionally speaking they’re both still hurt children trying to come to terms with what happened between them in the first trilogy. As you may have noticed my little devious prince set me up for another trilogy in the very last sentence of Mate. First I’m going to try my hand at shorter work, and I have — as yet vague — plans for Antybion, Rahendo & Ryhunzo, and a few others. No problem, Andrew. As I said the typos, etc. did not for one instance take away or distort the story in any way, shape or form. For the amount of work involved, you did a truly awesome job! Thanks for responding so gracefully though. There is so much to say about all these books. Gambit got its own new cover. Love it, though I still like the old one. There is something in that pose–a boy who took on a man’s job, knows he can kick a– because there is no alternative–and he outsmarts the best of ’em.
. . . and I cannot wait to read more especially of my two spritely/romping Billy Goats, R & R (do not be offended for your wonderful characters but that’s the image I come up with when I think of them). I do love them and can’t wait to see how they may have grown up. You know, when Ehander asked Emelasuntha if Tenaxos was truly Anaxantis’ father and she skirted the question with that ‘mind your own biz, boy’ manner, I couldn’t help thinking– hmm. . .. so yes, this story is so far from over and I am so looking forward all of them. Ehander found the stool that Randamor seemed to be fond of having his ‘audience’ sit on to hear the story. Who is Randamor? Ehander himself? one of the others?Obviously he was of the inner circle. . . This story is indeed far from over. You’re right in that respect. Doesn’t mean you’re wrong in other respects. And I have some very special plans for the Billy Goats. It may take some time, though. I wanted so much more for Ehander, to become stronger instead of just being the lover, to study and learn to make proper decisions, but sometimes that’s all they can be. Anax is becoming so ambitious. He may have moved the pieces with invisible hands but you can’t deny without the interference of certain players, in his favor, things might not have happened the way they did. However, as far as heros go he certainly is one! With this being the last book, I tried my best to read it slowly and make it last… Unfortunately it’s over. I loved reading this series. I hope there will be more! Thank you for sharing your stories. There certainly will be more. At first some shorter stories in the same world, and eventually a longer epic tale about Anaxantis and Ehandar. When I first read the series, I was impressed by the detail put into the strategy aspect of the story. Among other stories, this is still a top contender in this aspect. However, I recently watched the Kingdom anime and read its manga, and found a story with even greater detail and moreover diversity in strategy, especially with regards to large scale battles. Therefore, I recommend you watch/read this, and perhaps draw inspiration from it. Sorry for this late reply… I’ve been busy (as will become clear in my next post) and life kept happening. It’s been too long since I watched some really good anime anyway. I’ve already done a bit of looking around and it seems Kingdom is based on Chinese history, more particularly the Warring States Era. Can’t believe I didn’t know this was out for so long. Shame on me! I just do random checks on my fave authors/series, and saw it! I am so happy to be reading this right now!